It was a jam-packed weekend, to be sure. But I found some time late Sunday afternoon to begin my next Christmas gift. I finished my dish cloths. And now, I've begun some spa cloths. A spa cloth is slightly larger than a dish cloth. I'm using a different pattern from the dish cloths. But also another good one for a relative beginner. I'll post a link to this spa cloth pattern, along with the changes I made to it, in a day or two, when I've finished this first one. I can give you the finished measurements, then, too. I also finalized my Christmas gift list, for the gifts that I'll make. I think I've got everyone covered, including a couple of manly gifts. I'll give you that list this week, too. I love the look of that pattern! Is that picture your spa cloth? I have quite a bit of the cream colored cotton yarn left (bought the giant spool with a 50% off coupon before Hobby Lobby downgraded the coupons to 40% off a few years back) and need to get cracking on teacher's gifts for Christmas. Yes, that's it, in progress. I almost finished it last night. Just have to do the remaining edge. It's a nice pattern. I think it knits about as fast as the dish cloth pattern I used. They'd make nice teachers gifts, I think. Yes, a washcloth that is part of a spa gift set or basket. Thank you. I think these will turn out nicely. I'll post some pictures tomorrow, of the inspiration for these, to give you an idea of the finished gift. Belinda just asked my question. I wondered if spa cloth was a fancy name for washcloth or if it were bigger or something. I had purchased the yarn from Micheals with the coupon. I then was fortunate and on two separate occasions found the large balls sold at Walmart for half price at the thrift store. I knit tons, mainly because my own dish cloths were on their last legs. I have gifted them also. I find that a simple dishcloth or scarf pattern is kind of therapeutic to do. I don't worry about the pattern and much thinking gets done. I belong to an organization and people "knit" scarves, hats, mittens. We " sell" them at craft sales, but actually people purchase them. The money goes to our non profit and the knit goods to newly arrived refugee families. You might be interested in some additional free patterns. Look up "little house in the suburbs" blog. She has so many patterns. Great way to learn new stitch patterns. 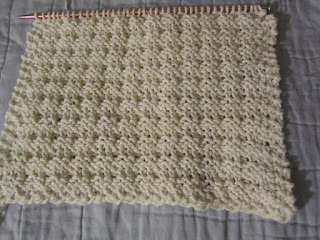 Many of the dish cloth patterns are similar to the patterns I am knitting on a 20 block Aran style afghan. You choose any 20 blocks( 12 inches by 12 inches) of 60 patterns available. These dish cloth patterns are also miniature versions of baby blankets I have knit. I have a book of wash cloth patterns that I picked up for 10 cents at a garage sale. Thank you for sharing the blog site, TG (Theresa?) I love to collect patterns, something of a habit from the old days before internet. I am currently working on some knitted rag rugs. This weekend I used leftover 1" knitted shirt strips, slightly thicker than tshirt. It came out OK, but I see that I have to tweak the needle size and try thinner tshirts instead. I like the softness of knit vs the rough, knotty feel of crochet. However, I think the knitted rows were too loose and squished around under my foot. I prefer a tighter knit in a rug. My task now is to make more strips, my least favorite job to do. I find wearing a dust mask helps (since I tear the strips rather than cut.) Over the weekend, my husband made a pair of large size knitting needles from scrap dowels pieces and wooden knobs leftover from a bifold door kit. Good thing we saved those knobs though we had no idea when and where we could use them. I must say, he did a beautiful job belt sanding the tips to perfection and varnish staining for a nice glossy finish. 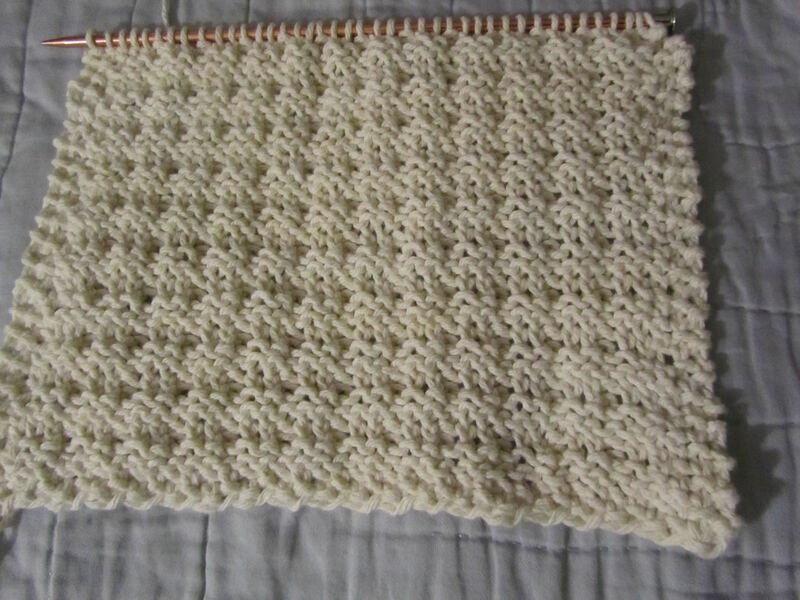 However, the descending rows didn't come out as nicely as the ascending rows, no matter how tight my knitting tension on the descending row ends, so I cross knitted two rows on the loose sides of the dishcloth. I have never personally used knitted dishcloths before, how do you like to use yours? Thank you for the knitting pattern source. I'll check out that blog. I agree on the therapeutic nature of knitting something simple, no increasing/decreasing of stitches to keep track of, nothing complicated. I love the sound of your afghan. I could do that! I'm always on the look-out for a project that I could realistically do. thank you! What a wonderful organization you knit with. And such a great cause. Thank you for taking time out of your busy days to read my blog. That touches my heart, truly. Have a great day! The afghan sampler pattern is from Leisure Arts 60 Easy-To-Knit Pattern Stitches Combine to Create Sampler Afghans. Years ago I purchased the booklet at Michaels, along with waiting for a sale on the yarn. ( I waited and found enough in one dye lot and purchased all at once). I since have found enough other colours through estate sales to make additional ones of this or another different afghan. I have been working on this afghan a while , putting it down for months over the years. I originally thought I would make one for each of my four children and I might. They are starting to move out and appreciate the afghans and quilts they have been gifted. Ideally if I could plan it I'd like to finish an afghan for a wedding or major life event for all of them. The variety is what makes this a hit for me. I'm not a crocheter so... When I am ready to join them it will be a new skill to learn. I may choose to add knit strips around. Once I brought my knitting on a short trip but forgot the pattern. I think I was printing one of the patterns to knit and left it in the copier. I looked up and could pay to download to my iPad. But it was a short visit and I decided to not do that. So I ordered it off Amazon. The pattern cost about $2.00 and the shipping $6.00. It came after about a month from the UK! This actually was the least expensive route. My Michaels did not have it. Any how in dollar cost averaging I think it's a pretty well priced pattern book. Thank you, Teresa! I have a nephew getting married in one year and you've given me a great idea for a wedding gift. And my nephew is part Irish, so an Aran-styled afghan sounds so perfect. I have never heard of a spa cloth before. What a pretty stitch pattern! Spa cloth sounds so fancy, doesn't it? It's an easy stitch pattern and would look nice in a sweater, or scarf, I think. Oh how fun! I am terrible at knitter. I like to crochet. I am working on hats to go with socks that I already have. My hope is to learn crochet some day. Your hats sound like a perfect addition to go with socks. Have a great day, yourself, Patti!